This past summer, my family spent a few days in the picturesque town of Petoskey in northern Michigan. While there, we were advised to visit a certain nature reserve just a short drive out of town, which had a path leading to a secluded beach on Lake Michigan. We weren’t disappointed by the spectacular view which awaited us, but it was the large sand dunes which really caught my eye. We stood on a large wooden platform which overlooked the beach, and were surrounded by large windswept dunes. A posted sign asked visitors to refrain from leaving the platform to climb the dunes. The sign explained in detail how disturbing the dunes leads to their erosion and eventual collapse. The Creator, in His infinite wisdom, causes plant life to grow on the dunes, which trap the sand, keeping it in place. Treading on these plants can uproot them, and will eventually doom the entire dune. The deer and other assorted native wildlife apparently had trouble reading the informative signI noted with interest that the “undisturbed” dunes were actually full of footprints. While it seems that the human tourists were environmentally sensitive and refrained from walking on the dunes, the deer and other assorted native wildlife apparently had trouble reading the informative sign. This phenomenon doesn’t seem to bother the ecologists. 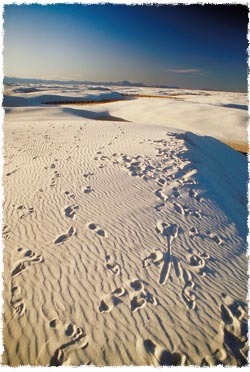 After all, the deer tracks are as much part of nature as the sand dunes themselves. It would be illogical to preserve one aspect of nature by repressing another. Why repress human nature to preserve sand dunes? The answer lies in the intrinsic difference between humans and all other forms of life which inhabit our planet. We are not just another species of mammals; we are fundamentally different. All of G‑d’s creations were created with a specific nature and character, above which they cannot rise. The human, on the other hand, has the ability and the obligation to transcend his nature. Indeed, this is the very purpose of Man; to use his intellect to control, and eventually transform, his egotistical and harmful tendencies, addictions and personality. Thus, we are the guardians of our planet, because only we have the ability to curb our personal natures for the sake of a greater good. This is true in the ecological sense, and it is certainly true in the spiritual sense as well. There is a haunting Chabad song with Yiddish lyrics: “Eating is natural, drinking is natural; what shall we do—praying isn’t! Eating is natural, sleeping is natural; what shall we do—studying isn’t!” (Click here to listen.) The lament expressed in this song is one we can all relate to: why is it that our physical needs come so much more naturally than our not-any-less-vital spiritual essentials? But this is the purpose of our creation. When we refrain from treading on sand dunes, or when we recycle, we transcend our animal natures and we earn the title of human. When we do a mitzvah, we transcend our human nature and reveal our divine core. Rabbi Naftali Silberberg is a writer, editor and director of the curriculum department at the Rohr Jewish Learning Institute. Rabbi Silberberg resides in Brooklyn, New York, with his wife, Chaya Mushka, and their three children. What Gives Us the Right to Kill Animals? What is the Jewish view on ecology and environmentalism? I want to add something more... I am a poet and writer. I see the profound metaphoric connectivity that dominates all that IS, meaning a poet lives in the metaphor, and perceives the inherent one ness to all Creation. And so when I observe the metamorphosis of the butterfly, I see that we are all metamorphic creatures who do grow and change as life takes us places. Autumn for me is the time of Moses, and the "burning bush" and there are surely other allusive connects to this time of year, as in aut, being about going inwards, and our days of Elul. I see within all Nature what is singing, and it's really remarkable how it is the same song, wherever I look. I feel a deep kinship with all Nature, all Wilderness, and that's about the birds and the bees, the bears, the owls, the elephants, all animals and all plants, that grow and are part of this Earth. All Creation has a Divine Core I do not see the world as you do. I see the anima or soul within the animals, and I see that what they do is not defiling Nature and that these particular footprints in the sand are not desecrating the sand, nor the environment, this delicate balance of nature, but that man's nature is the desecrating force. We kill animals thinking we're superior and we're not. I have written and spoken so often on these pages, when I come to a tract or treatise about how we are superior, or have judgment "they" do not have. I would think, if you studied animals, their communication, their amazing ways, you would have another opinion and might feel man is less special on that totem pole of life forms. Sorry, I cannot agree, and find this an excuse for some practices I witness that is so much about desecration of the environment. Yes to such decisions in favor of environmental action but no to this hierarchy of "special" which I find specious. To Mr Nice "just after Tu B Shevat, very timely and a reminder that unlike the animals we have a higher responsibility to cultivate and guard the world."